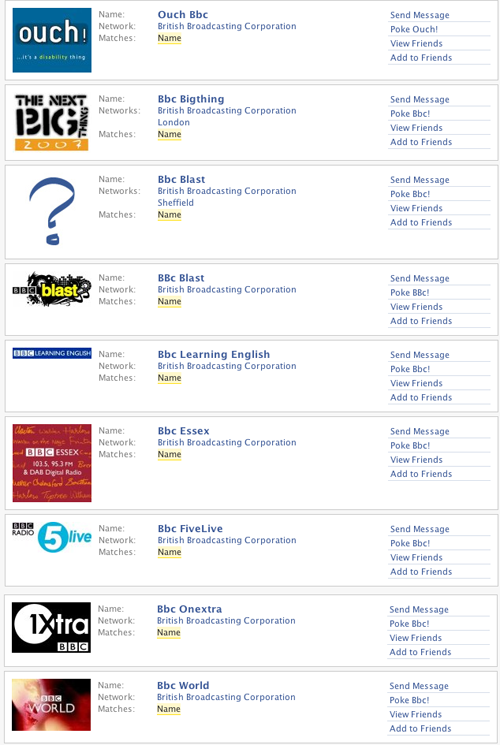 It’s understandable that companies want to use Facebook to promote stuff – it is after all very big – and with almost a half of BBC staff on there, it’s obvious that they should use it to promote services, programme and events. What is annoying is when people who don’t understand social networking blunder in. Facebook has worked so far because of its “honesty” (real names, needing verified email addresses to become part of some networks) – it’s ceded to demand for entities other than people by the creation of “fan” pages/profiles, and has for a long time had groups and events. When the Beeb gets the social web right (Backstage, Flickr stuff, plenty more I’m sure) it’s a great thing. Letting people think it’s okay to create all this “white noise” on the social web isn’t. I’m sure many other organisations have done this too – I just think the Beeb should set an example. Discalimer: I used to work for the BBC (although I’d have been just as annoyed about it when I worked there – and would of been able to tell the people more easily).